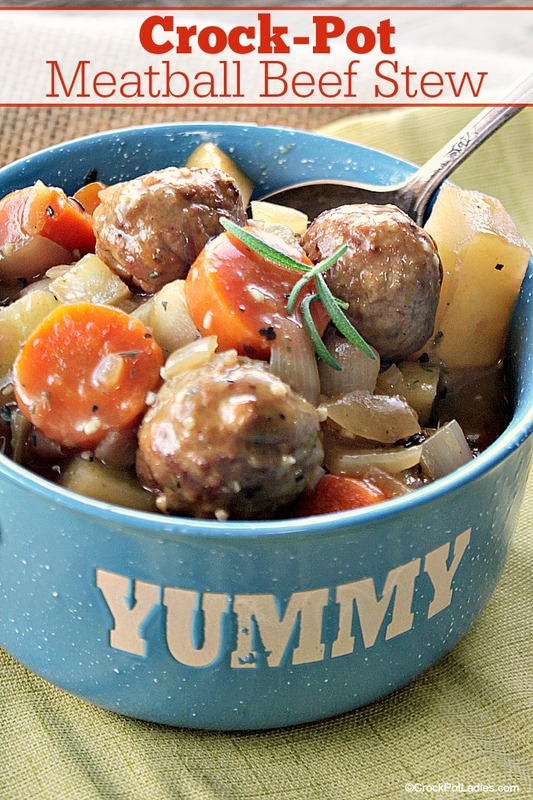 Warm up to a big bowl of this hearty and delicious Crock-Pot Meatball Beef Stew. This slow cooker recipe features tender meatballs simmered all day in a mouthwatering sauce with carrots, potatoes and onions. This recipe came about because I had a hankering for a bowl of beef stew but my kids were turning up their noses at that idea for dinner. Not that they don’t like beef stew when I make it, just that they were just not feeling it on that particular day I guess. Now normally my kids are all over meatballs. I think there is just something about the fun rolly-polly shape that makes them appealing to kids. 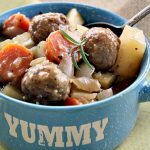 So I thought that maybe I could combine what I wanted (beef stew) and something my kids would like (meatballs) and came up with this super yummy recipe for meatball beef stew made in the slow cooker. Brilliant mom moment if I do say so myself. My recipe starts out with a bag of frozen meatballs (I like the Farm Rich brand myself). But if you want to make your own pre-cooked frozen meatballs…by all means please do. I am a busy mother of 5 kids (plus 2 grandsons living at home at the moment too) and that means sometimes I do reach for the convenience of frozen meatballs. You do what you gotta do sometimes. Then you add in potatoes, carrots, onion and garlic. You could add in some diced celery too if that floats your boat. Our family does not like cooked celery so I did not use it, but I understand that celery is a pretty common ingredient in stew. Then you add in some spices. I really just kind of winged it here. Bay Leaves, oregano, rosemary, black Pepper and a pinch of salt. Poured in some low-sodium beef broth (I used store bought, but you can of course use homemade). Then to thicken it up I made a slurry out of some flour and water and poured that in. And turned it on to cook. I let it cook for a while and took a taste test (don’t worry the meatballs are already cooked so no worries about sipping raw meat broth) and just felt something was missing. I so started ransacking the pantry and spice cupboard. Do I add more garlic? More onion? More spices? Different spices? And then I spotted it, way back in spice cupboard. A box of onion soup mix. Hidden behind the cumin and dried out vanilla beans (I really should figure out a recipe that uses dried out vanilla beans!). So, I tossed that envelope of onion soup mix and hoped for the best. And when it was done, and my oldest daughters FINALLY got home from the store with my rolls to serve it with (it was allowance day…they were off looking at cheap jewelry and new winter scarves despite my telling them that I needed rolls in a hurry so we could feed the hungry wild beasts little kids. 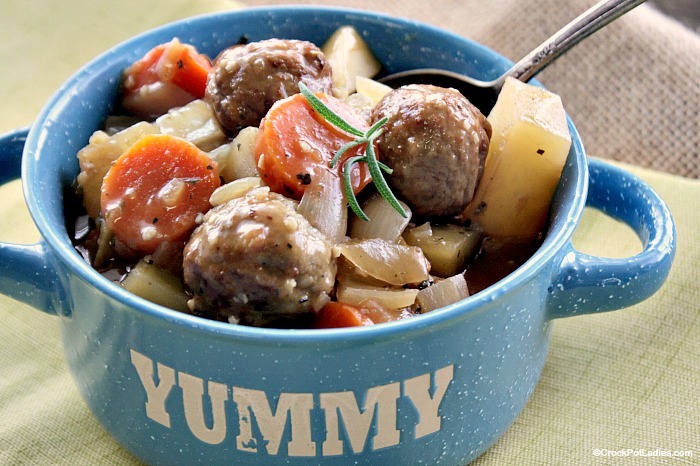 This easy meatball stew recipe is a different take on traditional beef stew but uses frozen pre-cooked meatballs instead of stew meat. The entire family will enjoy it! 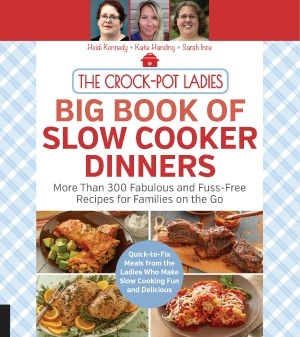 In a 5 quart or larger slow cooker add the meatballs, sliced carrots, diced potatoes, diced onion, beef stock, onion soup mix, garlic, bay leaves, oregano, rosemary, black pepper and salt. In a bowl mix the flour and cold water well with a fork until you have a slurry with no lumps. Add the flour and water slurry to the rest of the ingredients in the Crock-Pot. Stir to combine and mix everything together. Cover and cook on LOW for 6 Hours or on HIGH for 4 Hours until the potatoes and carrots are cooked to your desired doneness. Remove bay leaves from stew and discard. Serve this delicious stew with rolls or bread for sopping up the stew juices or spooned over rice or egg noodles if desired. Riffed off your stew recipe (I didn’t have all the ingredients) and it’s in the crock-pot now, but I wanted to let you know you can rehydrate those dried-out vanilla beans right before use very easily. Just lay the bean out on a small flat pan or dish and pour hot (but not boiling) water over them just to cover, let steep for 15 minutes until they’re flexible. Use the water to make really amazing hot cocoa! 🙂 You can also toss them in the food processor with sugar to make vanilla sugar, just grind up one bean with one cup sugar until it’s basically disintegrated, and mix that into three more cups sugar to make a total of four cups of sugar. Store airtight. Vanilla sugar is amazing in baking and any kind of sweets! You can also just use them as-is in custards or cooked pudding, just simmer the bean in the milk for 15 minutes and strain out (1/2 bean at most for 4 C milk). Or make homemade vanilla extract: break up the beans and put them in a jar with a cup of vodka and shove it in the back of the cupboard for at least 3 months. Mark your calendar to dig it out. 🙂 Tah-daaah, vanilla extract, with no weird additives. Use as you would the store-bought kind. Thank so much for the awesome tips Mari! I took one of my dried out vanilla beans and ground it up in my coffee grinder with some beans, let the ground coffee set for a couple days in a jar and it makes an awesome cup of vanilla coffee! I don’t eat meat, but I just put this in my slow cooker for my guys.. and I must say, it smells amazing! I sent them a picture and they were drooling. I’m sure they will love it and the oregano and bay leaf is what I am smelling. This and the onion soup mix, all combined creates a wonder aroma. Thank you for this recipe for the first day of fall! It’s still warm, but overcast and windy, so I will keep the air on in the house and “pretend” Fall is really here. Thanks for taking the time to comment Ingrid. The smell of this stew is indeed pretty amazing. The combination of the oregano, bay leaf and onion soup mix is what makes this one of my families favorites! This really is one of my favorite recipes. The meatballs end up tasting great!